Cool! Sounds like the Ventures meet Roy Wood’s Wizard (minus all the screeching kids). Martin Cilia is the reigning surf guitar king in Aussie land and he’s doing the Christmas thing this year. “Electric Christmas” is set for an October 9th release and features 11 traditional tracks and three Martin Cilia originals–“Christmas In July”, “Christmas Stomp”, and “South of the Equator”. Martin was born in England and spent the first ten years of his life, there, so he gets the whole cold and snow aspect. In those formative years, Martin recalls being heavily influenced by the music of Christmas. After moving to Perth, Australia, he turned pro at 14, playing in a variety of rock bands before going solo. He released his first solo effort,“Revenge of the Surf Guitar”, in 2007. 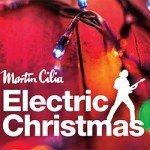 “Electric Christmas” will be Martin’s fifth studio album. While trying to stay true to the carols as he heard them back in England, Cilia gives them a half-twist via original arrangements. You can rock out with songs like “God Rest Ye Merry Gentlemen” and you’ll feel like you’re living in a Frankie Avalon movie when “Christmas In July” plays. Coming from Australia, I imagine you’ll see Import prices if and when “Electric Christmas” turns up on Amazon. But, short of hopping on a plane and going to the land down under, you can get a decent price pre-ordering direct from Cilia. Don’t be intimidated by the $25 figure. The US dollar is strong in relation to the Australian dollar, so your number will be more like $18 or $19 and shipping is free. Or maybe you’d prefer to wait until the disc comes to CDBaby, where it looks like you’ll get a domestic price (plus shipping, though). Head over to Martin’s web site and you’ll be able to sample some more of the record while you consider. But don’t dawdle because…..